Saving The World’s Wildlife: WWF – The First 50 Years by Alexis Schwarzenbach is, rather unsurprisingly, the story of the formation and first five decades of one of the worlds foremost conservation organisations, the World Wide Fund for Nature (or World Wildlife Fund as it started out in the 1960s). The WWF is one of those organisations which is recognised globally by millions, thanks to its iconic panda logo. It is something I have been aware for as long as I can remember – when I was a child, maybe around 5 years old, I collected all the stickers in a WWF sticker album which taught me about the animals of the world and the dangers they face. When I heard about this book, I thought it would be an account of the work that the WWF has done over the years, how they have helped save species from the brink of extinction and create conservation areas and national parks around the world. Flicking through the book when it arrived, this impression continued as it had plenty of beautiful colour photos of animals, birds and landscapes. Unfortunately however, the title of “Saving the World’s Wildlife” is actually slightly misleading. The book is not about what the WWF has accomplished, but rather the growth of the organisation, its structure and the challenges it has faced from an organisational point of view. Of course conservation efforts feature but only in broad terms, and only the more prominent campaigns. The establishment of the Coto Danaña reserve in Spain, Operation Tiger and the controversial Operation Lock all receive coverage. The focus is on the organisation itself, the set up and management of WWF, the politics and the problems faced. There is an appendix giving a summary of projects year-by-year since WFF began in 1961. Despite my expectations being wrong, Saving The World’s Wildlife turned out to be an interesting book. WWF has been around all my life, and being something that I’ve always been aware of it was strange to think that it really wasn’t a very old organisation, and was only 20 years old when I was born. It was also interesting to learn about all the problems that were faced, from a troubled relationship with the International Union for the Conservation of Nature (IUCN), which WWF was intended to fund, to the feud between WWF International and WWF US. 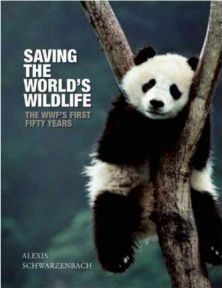 Saving The World’s Wildlife is an attractive book – its cover features a lovely photo of a panda, and there are plenty more fantastic images inside. But don’t think that it is a picture book, because there is plenty of reading in here. I may not have got what I expected with Saving The World’s Wildlife, but I did enjoy it. And although the focus was not on their work, the book still prompted me to join WWF and adopt a jaguar. So be warned – this book may make you part with your cash. Many thanks to Profile Books for providing a review copy of Saving The World’s Wildlife. No Comments on "Saving The World’s Wildlife"